Medium: Inkjet on Velin Arches Blanc and Asuka Natural paper. Sopra le scoperte de i dadi was printed on Arches Cover stock on a Canon iPF6400 inkjet printer. 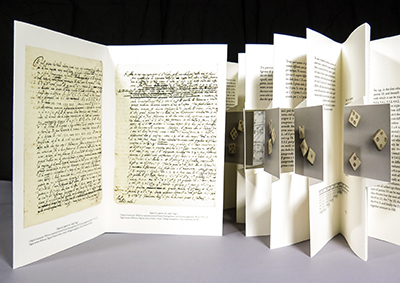 The images of the Galileo manuscripts and the individual dice throws were printed on Asuka paper, then dry mounted into the pages of the book. 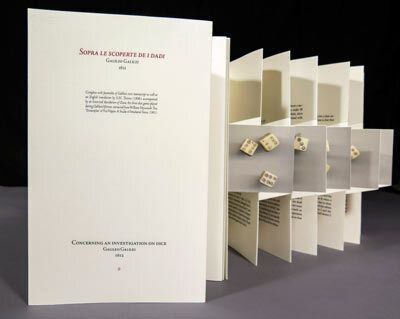 The simple structure of the concertina book has been amplified with a series of floating panels, a structure the creator Hedi Kyle calls a panorama concertina. The typeface used throughout is Adobe Jenson Pro, both in its regular and italic iterations. Adobe Jenson is an old-style serif typeface drawn by Adobe’s chief type designer Robert Slimbach and based on a text face cut by Nicolas Jenson in Venice around 1470. The italics are based on those created by Ludovico Vicentino degli Arrighi fifty years later. The scale selected to determine type sizes is a double-stranded Fibonacci series used by Le Corbusier in his architectural works and deemed useful for typography by Robert Bringhurst. The Galileo manuscripts were acquired through a PDF directly from the online Biblioteca Digitale, Museo Galileo. Galileo’s original paper manuscripts are housed at the Biblioteca nazionale centrale, Firenze, and rest in Fondo galileiano, Gal. 84 (antica segnatura: Div. 2a - P. VI, t. 3). Various astronomical calculations scattered among the Galileo notebooks are included on the verso of the sheets as a curiosity. The exquisite bone dice were made by Michelle Duvon and were thrown repeatedly and randomly until an aesthetically pleasing number of combinations was generated. 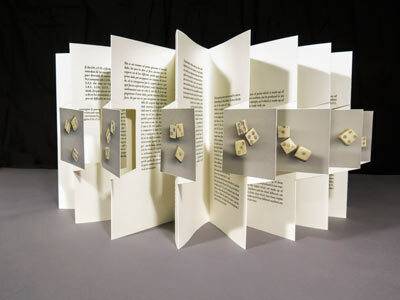 Images of dice floating among the pages of text in Italian and English. Facsimiles of Galileo's original manuscript.